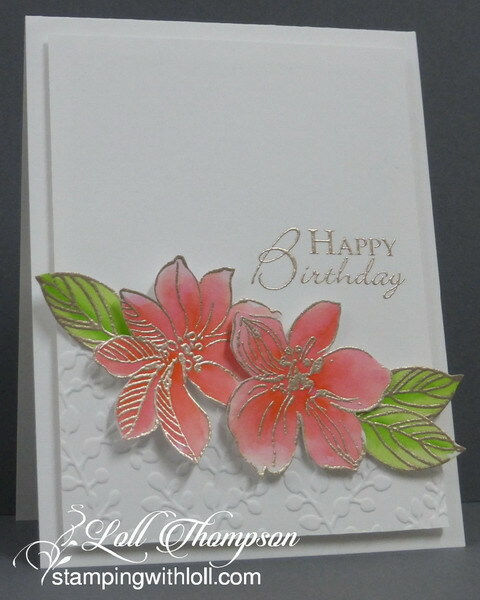 Stamping with Loll: Happy Birthday Barb! Hi everyone. Sharing a card I made to celebrate my friend Barb's (Barb's Studio Creations) birthday, which is today. I sent this off to her a couple of weeks ago, and thankfully it arrived before the big day. :) Hope you are having a wonderful birthday Barb!! I used my NBUS Wild Hibiscus stamp set from Altenew. Just had to buy this set after seeing these beautiful cards made by my friend Hazel. I started by heat embossing the flowers and leaves in liquid platinum embossing powder. Then I sloshed on some colour using my zigs and a damp paintbrush. I fussy-cut them and then popped them up over top of a dry embossed curved piece at the bottom. Love the texture and design from this embossing folder. gorgeous card Loll - lucky Barb to receive it - she'll surely love it!!! I'm not one to comment on all the cards I see and love and pin... but THIS ONE stopped me in my tracks! SO lovely!! I love the way you used dry embossing here, adds a lot of interest! I thought Hazel had used this stamp in almost every way possible! But you proved me wrong! WOW! This is GORGEOUS! So pretty. I like the embossing folder you used and the font of the sentiment too! Beautiful card. Love, love, love those flowers! Beautifully set off with the platinum embossing powder and the embossed background, Loll! Amazing card. I love the softness that gives vellum. Beautiful card, Barb will certainly be very happy. That embossing gives those flower a base to curve along and it looks fabulous, Loll. Beautiful! Love the watercolor with the liquid platinum embossing powder and your gorgeous coloring. Pulled mine out the other day after seeing your work with it. Fabulous embossing folder! Stunning card! I love that stamp set and you've used it beautifully! And I just learned that it's also your birthday, today! Hope you had a very happy one! And that you got lots of new crafty stuff! I was wondering when you would be using this set... Haven't touched mine yet... Absolutely loved what you made with it. This card goes straight into my inspiration folder! Loving Altenew Stamps everywhere Loll, and you've done these beautifully, I haven't succumbed yet. Do have ones that would look nicely like this though. Thanks for your inspiration, checked out the link too, more lovely cards. This is so gorgeous Loll. Love the colors. Love that platinum ep with watercolouring! And of course your Zig watercolouring is gorgeous as always! Beautiful- the heat embossing and water colors are wonderful. This is simply beautiful ...... the flowers look so pretty against the embossed background and it's that embossing powder again ..... stunning! Now, I'm really embarrassed...finally getting caught up on my visiting! I am so, very grateful to be the recipient of this GORGEOUS card, Loll! Your sweet birthday wishes warm my heart, and I must say your beautiful card is sitting on my shelf next to my desk...a place of prominence in my craft room :) Thank you again...you're the best!